On June 12, 2009, President Obama sent a memorandum to the heads of executive departments and Federal agencies establishing an Interagency Ocean Policy Task Force and charged it with developing recommendations to enhance national stewardship of the ocean, coasts, and Great Lakes. The Task Force was led by the White House Council on Environmental Quality (CEQ) and included 24 senior-level policy officials from across the Federal Government. The Task Force released an Interim Report in September 2009 and an Interim Framework for Effective Coastal and Marine Spatial Planning in December 2009, and received and reviewed close to 5,000 written comments from Congress, stakeholders, and the public before finalizing its recommendations. The Task Force’s Final Recommendations combine and update the proposals contained in the two earlier reports. On July 19, 2010, President Obama signed Executive Order (E.O.) 13547 adopting the Final Recommendations of the Interagency Ocean Policy Task Force and establishing a National Policy for the Stewardship of the Ocean, Coasts, and Great Lakes. This order establishes a national policy to ensure the protection, maintenance, and restoration of the health of ocean, coastal, and Great Lakes ecosystems and resources, enhance the sustainability of ocean and coastal economies, preserve our maritime heritage, support sustainable uses and access, provide for adaptive management to enhance our understanding of and capacity to respond to climate change and ocean acidification, and coordinate with our national security and foreign policy interests. In early 2012, the National Ocean Council released for public comment the draft Implementation Plan. The final National Ocean Policy Implementation Plan was released on 16 April 2013 and incorporates suggestions on the draft, including key support for local and regional capacity and self-determination, and the development of more and better information related to ocean conditions. The White House press release is available here. The Plan describes specific actions Federal agencies will take to address key ocean challenges, give states and communities greater input in Federal decisions, streamline Federal operations, save taxpayer dollars, and promote economic growth. The plan specifies that regional stakeholders will determine the scope, scale and content of collaborative marine planning, that participation is voluntary, and that regional planning bodies will be established only in regions that want them. The Council developed the Implementation Plan over the past two years with extensive input from national, regional, and local stakeholders from all marine sectors; tribal, State and local governments; and the private sector, scientists and the public. In March 2015, the National Ocean Council released its Report on the Implementation of the National Ocean Policy. The report highlighted the status of progress made by Federal Agencies in carrying out all 214 actions described in the National Ocean Policy Implementation Plan. The many accomplishments realized through the original Implementation Plan set the stage for a targeted approach to future NOP implementation. As many of the actions in the current Implementation Plan are completed, progress on the NOP will continue under Annual Work Plans to focus on pressing issues in a defined timeframe. A longer-term, higher-level implementation guide (Guide) based on the original Implementation Plan themes will provide the overarching context and vision for crafting the Annual Work Plans and implementing the NOP in future years. 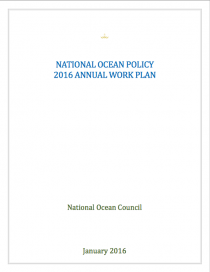 In January 2016, the National Ocean Council released the National Ocean Policy 2016 Annual Work Plan. This Annual Work Plan was developed by an ad hoc interagency working group, in close coordination with NOC leadership and the interagency policy committees charged with implementing the NOP actions. The four Priority Areas for 2016 were recommended by these interagency committees, and approved by the NOC Deputies’ Committee. Selection of Priority Areas was – and will be in future Annual Work Plans – based on areas of pressing need that are prime for short-term advancement and contribute to the NOP goal to promote the well-being of the ocean, coasts, and Great Lakes, and the communities that depend on them.